World leaders, former presidents, and politicians gathered at the National Cathedral in Washington, D.C., on Wednesday for the State Funeral of George H.W. Bush, who passed away late Friday night at the age of 94. Now, a lip-reading expert has spoken out to reveal the nasty secret Barack Obama tried to hide from the public during the service. According to Inside Edition, all of the living former presidents and vice presidents appeared together Wednesday to mourn the death of President George H.W. Bush in Washington, D.C. Many political rivals came face to face as they paid their respects to America’s 41st president. Expert lip reader Larry Wenig said that everyone seemed chummy until President Donald Trump and First Lady Melania Trump arrived, at which point they were greeted with a simple “good morning” and no small talk. According to body language guru Dr. Lillian Glass, however, the Obamas’ body language spoke volumes, saying everything that their mouths did not. “They are trying to be cordial, but their true feelings are coming out,” Glass explained. Footage of the moment when Michelle Obama and Donald Trump shook hands immediately went viral for the same reasons which Glass mentioned — it was clear that the former first lady was having a difficult time remaining cordial, and she even raised her eyebrows to show her displeasure with the situation. But, according to Dr. Glass, there was also a touching moment between the Bush brothers after George W. Bush delivered his heartfelt eulogy for his father. “George Bush sits down and his younger brother, Jeb, comforts him and touches his knee, and that speaks to the emotion and the closeness of their relationship,” Glass said. There was simply no denying the fact that the Obamas were uncomfortable sitting next to the couple who replaced them in the White House. Perhaps if they had not spent the past two years attacking the Trumps at every turn, the situation would have been a bit less awkward. 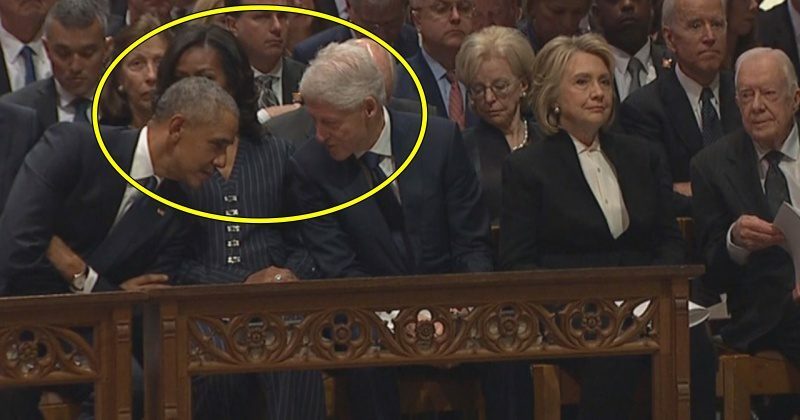 But, leave it to Barack and Michelle to turn a former president’s funeral into a scandalous affair.